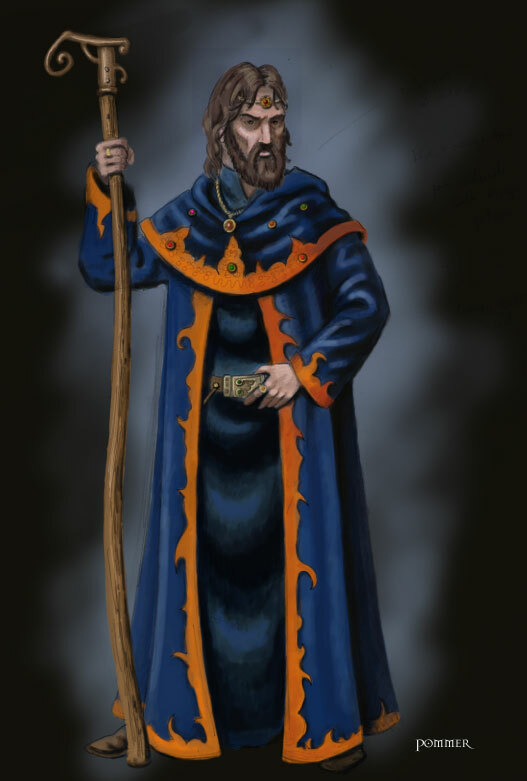 Here's a more detailed illustration of the first mage concept I posted. My take on these guys is that they dress in flashy, rich-looking clothing to draw attention to themselves. Our setting proposal is that it is illegal to charge money for magic. Mages either sell on the black market or they manage to get a wealthy patron who supports them in return for their 'wise counsel'. 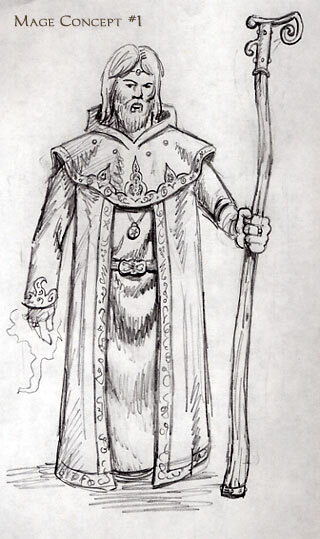 Mages who can dress really well must have a powerful patron who really values them--and who will therefore fight for them should the Builders feel inclined to charge them with heresy. The rich clothing is almost like political armour. Looks great. I'm sure everyone will see them as fire mages from T1 because of the firey detail around the cloak. I like the Celtic-style beard on him. But perhaps ginger/red would be a more historically accurate tint. Just kidding, it's much better brown. Looks really good to me. I agree they look a lot like fire oriented, so maybe there should be some others for different orientiations? Sweet! And yes to focus mages! Very nice work Spring! I think that looks fantastic. I agree they look a lot like fire oriented, so maybe there should be some others for different orientiations? I thought about having different mage looks for the different elements at one point. Fire mages, Earth mages, etc. But that's a lot more models for a faction that's kind of rare as it is. Mixing and matching different heads and skins on the same models should provide some nice variety.